The PW4000 is divided into three distinct families based on fan diameter. The first family is the 94 inch (2.4 m) diameter fan with certified thrust ranging from 52,000 to 62,000 lbf (230 to 275 kN). It powers the Airbus A310-300, A300-600 aircraft, Boeing 747-400, 767-200/300, KC-46A, and McDonnell Douglas MD-11 aircraft and is certified for 180-minute ETOPS if used in twinjets. These models include the PW4052, PW4056, PW4060, PW4062, PW4062A, PW4152, PW4156A, PW4156, PW4158, PW4460, and PW4462. The second family is the 100 inch (2.5 m) diameter fan engine developed specifically for Airbus Industrie's A330 twinjet. It has certified thrust from 64,500 to 68,600 lbf (287 to 305 kN). Models are numbered PW4164, PW4168, and PW4168A. The launch of the Advantage70 program was announced at the 2006 Farnborough Airshow with a sale to Kingfisher Airlines. This package increases certified thrust to 70,000 lbf (311 kN), reduces fuel burn by about 1%, and reduces maintenance costs by around 15%. The third family is the 112 inch (2.8 m) diameter fan engine developed specifically for Boeing's 777 where it was the launch engine. Currently available on the 777-200ER, it has certified thrust from 86,760 to 99,040 lbf (386 to 441 kN). It entered service on June 7, 1995, with United Airlines, and was the first jet engine to enter service with 180-minute ETOPS certification. It was also an engine option for the 777-200 and -300. The PW4000 features advanced technology materials and Full Authority Digital Engine Control (FADEC), for enhanced fuel economy and reliability, as well as the Technology for Advanced Low NOx (TALON) combustor. The PW4000 is produced in three distinct models, with differing LP systems to address different thrust needs. ^ Jeff Schweitzer, Pratt & Whitney (14–17 July 2003). "Propulsion Technology Readiness for Next Generation Transport Systems". AIAA International Air and Space Symposium and Exposition. doi:10.2514/6.2003-2787. ^ Pratt & Whitney. "PW4000-94". Retrieved 4 January 2010. ^ Pratt & Whitney. "PW4000-100". Retrieved 10 April 2016. ^ Pratt & Whitney. "PW4000-112". Retrieved 4 January 2010. ^ "TCDS E24NE" (PDF). FAA. 23 November 2015. ^ "TCDS E36NE" (PDF). FAA. 28 May 2014. ^ "TCDS E46NE" (PDF). FAA. 23 January 2012. ^ "PW4000 94-inch-fan" (PDF). Pratt & Whitney. ^ "PW4170 Engine for the A330" (PDF). Pratt & Whitney. ^ "PW4000 112-inch-fan" (PDF). Pratt & Whitney. 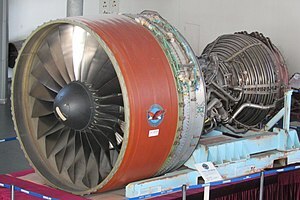 Wikimedia Commons has media related to Pratt & Whitney PW4000. This page was last edited on 16 April 2019, at 03:15 (UTC).